The drive down to the Dingle Peninsula was long but interesting, it was wet when we arrived, very tiny village is Castlegregory and our B and B was a few Khs down the road. It was lovely. We tried to drive over the pass to Dingle but the cloud was low and thick and we turned back halfway as we could not see anything. Today we drive 5 hours to Carton House which the Irish travel agent chose as our “airport ” hotel…..it is 45 minutes to the airport so we are checking out at 5.30am tomorrow. Two snaps of Castlegregory and one of Carton House. Left Dublin around ten and arrived at Ashford Castle just after 1pm in time to get to our Falcoln Walk at 2 pm…..a great experience. A few photos of Ashford Castle and the Hawkes. Both rather special. Our Hyundi i30 is parked out in front of the castle beside the Volvos, BMWs, Audis etc! But staff have been exceptionally warm and welcoming. Our room is lovely but curtains looking a bit tired! Had a good look around using Hop on Hop off bus, went to the Guinness Building and had a very interesting tour. Nice to be in a tolerable climate once more. The street of our guesthouse and me in the garden. Here we are in Dublin at a most exquisite guesthouse, Number 31, fantastic room, lovely setting, sumptuous bed ( after the rock hard mattresses of Turkey) and a lovely breakfast we are feeling normal again…..and I can see my ankles. Day started when picked up for our ride to the airport, driver did not speak English, then when we arrived at Attataturk Airport to chaos and confusion. Then I left my little carryon case behind when we were moved to another queue. It had jewellery, pills, travel docs etc in it. Ran back and there it was still sitting there, could have been blown up or taken but no just sitting there looking sad and lost. So then we go to the first security check, I sale through but Andy sets off every alarm and continued to do this at the five more security checks we went thru at Attaturk and Heathrow Terminal 1! He now thinks it may have been his hearing aids ( which he is supposed to remove before flying but forgot yesterday). He had full body scans, the works at every check! Then boarded on time, very old looking British Airways plane, the seat pocket in front of me was dirty and ripped! Started to taxi off when pilot said we were going back to gate as one engine had problems! One hour and forty minutes later, after they had rebooted a computer system and done full engine check we took off. Quick uneventful flight but many missed connecting flights. We had to catch bus from terminal 5 to terminal 1……in transit. Had many security check in terminal one including having our photos taken etc and Andy setting off every alarm. The board said it was a 20 minutes walk to our gate…….not quite but we were relieved to have made it in time……what a laugh. Some boarding check computer system had broken down and for security reasons we were bussed out to our plane. Good news as we arrived we saw our bags going on but we waited in the plane for an hour while they did checks, counting number on board again and again. Finally arrived at No 31 and went out for a meal immediately…..it was 10pm. Not 7.30pm which was expected arrival time! But new day and everything looks great! Off to explore Dublin now. 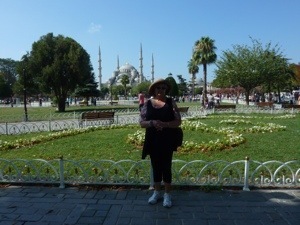 Stiflingly hot again, we queued for 40 minutes to get into the Hagia Sophia Museum, wow was it hot. My hair was soaking by the time we got inside ……but there is a refreshing breeze tonight which is so nice. Andy in the main part of the huge museum which had been Greek Orthodox Church and then later a mosque but is now a museum which is slowly being restored to its former glory. Lunch today ( it was so very hot) and dinner tonight – we spoke to a young kiwi couple who now live in London, they said the heat was exhausting them and they looked in early 20s – what hope for us? Our hotel – room on top floor but hard to see in this snap . In this area trucks are not permitted on the roads between 4.00 and 10 pm each day – they have big lay byes on the highways where the truckies wait. Small cars and taxis can go to 110 km per hour on the highways. The faithful are called to prayer about 5 times a day, the first being at 5.30 and the last around 10.30pm. The old part of Istanbul where we are staying is a mass of small roads which wind up and down hills, they do not appear wide enough for two vehicles to pass each other but they manage – we know as we have been in a car, a shuttle type van and a small bus all around this place……Sultanahmet. 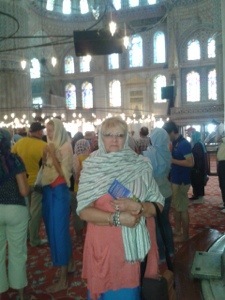 When a young man asks if you are looking for the Blue Mosque and before you know it he is walking with you to the mosque it is not because (a) You are a visitor in his country and he is pleased to help you or (b) he has a brother in NZ and wants to tell you about his brother or (c) his best friend from school now lives in Sydney which he knows is close to NZ…….no it is because after you have visited the mosque he will be waiting at the exit to take you to his carpet, or ceramic, or jewellery shop. Once there he will ply you with sweet apple tea and all his uncles and cousins will suddenly surround you. Very disappointed that I only purchased earrings for about $50! Despite the fact that we have had two days walking around markets and shops this morning was the worst ever, we could hardly move two feet without being politely (and they are mostly polite) harassed. After he changed into shorts and a cap it was much better. We also should never travel in Greece or Turkey ( and guess Shanghai will be worse ) in August. It is around 35 most days and being constantly in wet dirty clothes ( with accompanying hat hair or soaking wet flat hair) now Andy has also got heat rash. Beds in Turkey in summer in hotels often only have a bottom sheet on the bed with a very light cotton blanket on top, or just a top sheet as well. Lovely when the air con doesn’t work but a bit cold when air con is pumping out icy air. All mattresses in Turkey are hard with no give and the beds are low to the floor. Hard to get out of quickly when struck with cramp. Guests in hotels in Turkey always slam their room doors no matter what time of night, they also receive phone calls at all hours of the night, street cleaners love shouting and dropping their bins from a great height at 2.00am. It is okay when in Turkey to have 10 different kinds of cheese for breakfast! Lastly we should not get confused when quoted in $US, Euro and Turkish Lira……well was it two Euro for one dollar or for one lira. Better to get lira from the cash machine and pray that it will ask if you want to use English to make the transaction, Turkish is difficult to read. One more lastly why have Oceania cruise not unfrozen the $500 from my debit card that they froze when we boarded…..we disembarked Friday, they have had the amount we spent cleared but so far they have not lifted the amount they froze and they still owe us $120 US dollars!